FontAwesomePS - Font Awesome icons right inside Photoshop. Extract the provided CreativeDo_FontAwesomePS.zip file to the location of your choice. Open Photoshop CC and run FontAwesomePS from the Windows > Extensions > FontAwesomePS. Please make sure you have the latest version of Photoshop CC and Extension manager before installation. 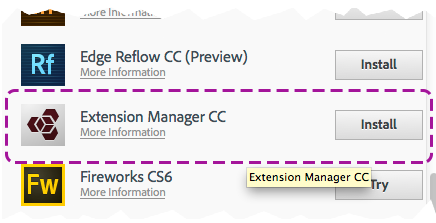 Open Adobe creative cloud and make sure you have the latest version of Adobe Extension Manager. Adobe Extension Manager will be opened, click the accept button. FontAwesomePS will be installed. Please make sure Adobe Extension Manager CC is opened. Windows users: You may need to run Adobe Extension Manager as an administrator by right clicking the Adobe Extension Manager from the start menu > select "Run as administrator". After Adobe Extension Manager is launched click the install button at the top and locate the FontAwesomePS.zxp file you have previously extracted. Feel free to contact us for support, questions and feature requests.